Mervyn Peake puzzle? Well, it’s been done, hasn’t it? There was that one back in CROSSWORD magazine 20+ years ago, and then that Inquisitor in 2008. Well, yes, now you come to mention it, both by me. [Actually, the first one of those had some wonderful anagrams in it, inspired by observing that TITUS GROAN becomes OUTSTARING; this led to the discovery that GORMENGHAST, with the S replaced by U, can become GRANGEMOUTH, and TITUS ALONE (S -> X) transforms to EXULTATION; incidentally, none of this TEA and Sympathy malarkey in those days – it was all done by sweat of brow and brute force anagramming. Noting the centenary of Mervyn Peake was a reflex action, but finding that it fell on a Saturday upped the ante immediately. 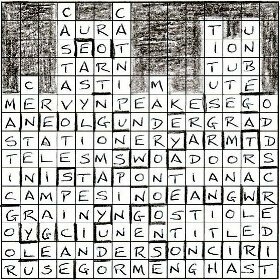 I drafted a grid quite quickly, but, while it was a perfectly fine puzzle idea (and we’ll come back to it in due course) it wasn’t that mysterious beast, a Listener puzzle. So I cast around for a further idea, and looked at the opening paragraph of the trilogy. The depiction of the castle there gave me the idea for the skyline effect – I particularly wanted one turret ‘point[ing] blasphemously at heaven’. That meant the puzzle would be carte blanche – pointless giving the outcome at the outset – which in turn led to some interesting solving challenges, and some thought into how to address them. Obviously, with a CB, you expect some hints about the symmetry to emerge (generally from the pattern of across word-lengths appearing as you solve), but here they would be deeply hidden by the fact that the first few clues would not adhere to any symmetry. However, making the main body of the puzzle symmetrical would still allow for some hints as to the pattern to emerge. Against that, I wanted some castellations to ensure you placed the Downs correctly. I may be very much on the side of symmetry in puzzles, but that doesn’t stop me wanting to play with the concept! I also planned some very long entries – especially vertically – as anchors for the grid. But, as it happens, MERVYN PEAKE and GORMENGHAST are the same length (indeed, the R, N and A are shared, as that 2008 Inquisitor puzzle utilised), so two of my long answers were immediately unclued, and of much less value. Obviously one of the first things you need to do for an anniversary puzzle is to ‘bag’ the date, and this I did. It turned out to be my last formal contact with Derek Arthur as an editor. His death was a tremendous shock. On a more practical level, the moratorium imposed while the editorship regrouped provided a worrying impediment to the timing. Not least, my earthquake puzzle moved to January this year – rather close to (indeed, slightly under) the six-month deadline for a setter’s repeated appearance if the Peake puzzle was to hit its anniversary. But the editors agreed to make an exception, even though, by this time, they had another CB for the preceding week – in fact, I had to change a corner of the original grid because of a clash of vocabulary between puzzles. Editor 1 failed to finish, and came back for a hint (the division point between across and down clues) – which editor 2 decided against giving solvers, so I reckoned that this would appear as a tough test. What we all three managed to miss was the absence of a clear statement that the clues were in the right order, which, at the moment of writing (late afternoon on 9 July, NZ time), is causing agonies of indecision in a certain online forum. At some point I revisited the title. It was originally ‘Keep in View’ (told you it was a visual stimulus). Looking at that one day, I suddenly realised the obvious anagram and replaced it for submission, rather tentatively, as I already had wind of some of the publicity that would surround the centenary, and thought it might be a bit of a giveaway. Editor 1 loved it, so that was that. I do know one solver twigged the theme before solving a clue, but I gather that didn’t make it much easier. Let’s just go back to that other puzzle I mentioned. I don’t like to waste ideas, and this was a perfectly good puzzle, so I finished it off, and it went in as an Inquisitor. Once again, I had to ‘bag’ the date and a reminder to that effect was my last exchange with Mike Laws. (So I am forswearing anniversary puzzles for a while at least.) But, for those of you who also do the Inquisitor, Plumrot is me, and the genesis of that pseudonym will accompany the solution notes. This makes a third CB in sequence. Looking back, I’d note that each idea is strongly visual – quite unusual for me; each also plays slightly differently with symmetry. 50-50 had the concept of the nested Ls, which I didn’t want to show at the outset, (much the same as the visual element of A Keep); Heart relied heavily on the image of sliding two halves of the grid. You may be relieved to know that my next Listener idea has a grid with bars and numbers. Another carte blanche from Phi, following on from 4122, Heart (about techtonic plates), and 4061, 50-50 (50 years old and 50th Listener). Here we had some misprints in the definition, four unclued answers, no answer or entry lengths, and numbers having no significance apart from delineating clues (as in Heart). But what was missing? It was present in Heart, and also in last week’s carte blanche by Shackleton: “Clues are presented in conventional order.” I reread the preamble; there was no mistake, it definitely didn’t say anything along those lines! It did say that not all cells are used and that only the bottom two-thirds of the grid had 180° symmetry. I suspected, given the title, that the diagram may end up being in the shape of a castle, but that wasn’t of immediate help. Only one thing to do, and that was get on with the clues. I pencilled a line next to clue numbers 6, 7 and 8 as a possible start point for the symmetrical acrosses, and another alongside clue numbers 19, 20 and 21 as the split between acrosses and downs. I have to say that I wasn’t really sure that this would help much. It didn’t! As I mentioned in my blog to Heart, my opinion of Phi’s clues has migrated from ‘straightforward’ to ‘tough’ over the last two or three years, and I was about to find out that he had no intention of slipping back into easy-armchair mode with this puzzle. I got these OK: 1 AURA, 6 UTE, 11 TELESMS, 13 PONTIANAC, 17 UNENTITLED, 23 DINGO, and even 26 EASY LISTENING. I can’t say I liked the indication of a hidden word at 23: Rolf Harris’s cheap recording omitted from account, with cheap being the misprint from cheat. I would find out later that there would be a reason for this! 32 NGOMAS and 38 PINNER completed my first pass through the clues, and then half a dozen more, so 15 at this point. The trouble was that ‘this point’ had arrived over an hour after starting and I had no real idea how the diagram would be looking since all I’d managed to do was doodle a few of the answers in the grid. I had also got a smattering of misprints, but …HY…O…T…IMB looked a bit odd and all that popped into my head was “Why do birds suddenly appear” from Close to You by The Carpenters. As an aside, I used to solve the Listener, Inquisitor and Enigmatic Variations every week, but the latter two have been taking a back seat recently. That’s a bit of a shame, since most of these puzzles are good, and some have PDMs to match the Listener. Consequently, on Sunday morning, I decided to solve that weekend’s Inquisitor (Trilogy by Plumrot), partly because Plumrot was such an intriguing name for a (new?!) setter, and partly because the colour used for the grid was a disgusting puce! Unfortunately (I suppose), it only took about an hour and a half, and turned out to have the Gormenghast trilogy by Mervyn Peake as its theme. 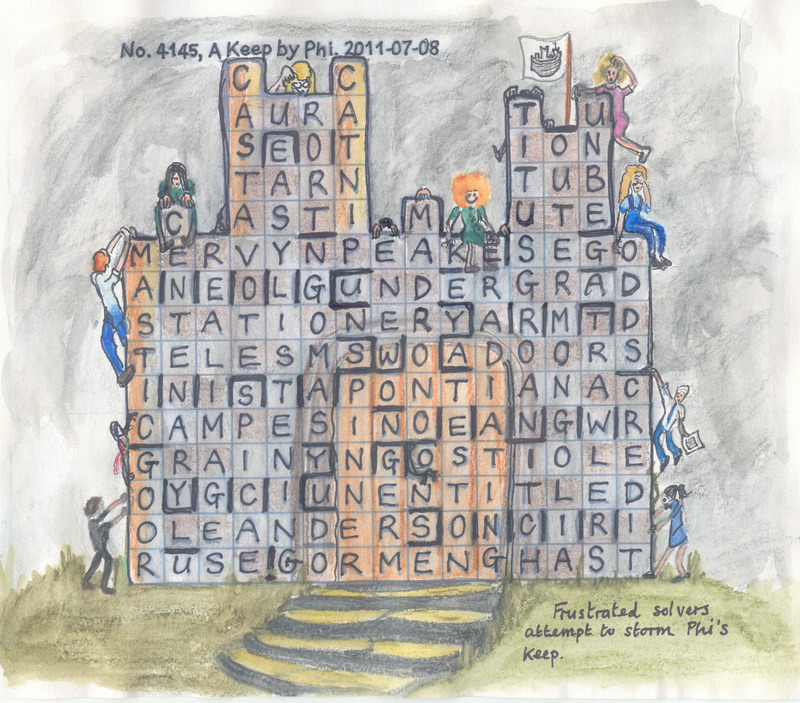 Returning to Phi’s puzzle later that day, and all became clear: A Keep / Peake, Peake being the thematic creator mentioned in the preamble, two works probably being Gormenghast and one of the Tituses, and the occasion being the centenary (or anniversary) of his birth. As a result, my grid doodles became a bit more solid. I put MERVYN PEAKE in row 6, GORMENGHAST in the bottom row, and neatly slotted EASY LISTENING and ERADIATING in columns 5 and 11 to intersect with them. The start of the symmetrical acrosses was therefore clue 7, and the start of the downs was 21. If you’re like me, you had a number of problems with the misprints, primarily because not all clues contained one. You start seeing misprints that aren’t there: 25 Hardy’s to pass on tanner with edges trimmed where I was convinced that Hardy would become Tardy. You see the wrong misprint: 32 Mangos pulped for African balms, where surely balms would become palms (rather than balls, in ODE). And some are just too well hidden: Kudus for Kudos in 40. The last clue to be resolved was 35 Party upset policeman in the lane in LA which needed the line to be checked in Chambers to see that it means ‘the odds, esp on football games, set by bookmakers (N Am)’. And so, the grid was finished, and no highlighting required although I did opt to shade the sky above the castle black, mainly because I didn’t know whether I would need to surround the completed part of the grid with a black line if I left it blank. And as for the clues being in the conventional order? Well of course they were! So another good tester from Phi, celebrating the CENTENARY of Mervyn Peake’s birth … just like the Plumrot Inquisitor puzzle. Hmmmm …? This one took slightly longer, however … about 6 hours, so thanks for that! No. 4145, A Keep by Phi. I vaguely recall saying something about beginning to enjoy the carte-blanches. Some crosswordy god obviously heard me and decided to add to the joys so we received Phi’s current offering with no clue lengths or bars and the extra sweet touch that ‘The numbers have no significance other than to make clear the divisions between individual clues’. Just to add to the pleasures, we had misprints in an unspecified number of clues, unclued answers and a grid that was not going to be totally symmetrical. Come now, Phi, weren’t you able to add a bit of invisible ink, a handful of knight’s moves and a playfair square as well as a smattering of jumbles? Shame! To be quite fair to Phi, he gave us a wonderful lead in to the theme in a five-letter title A KEEP. For reasons I shall never understand, the other numpty is quite a fan of Mervyn Peake and immediately muttered PEAKE, Gormenghast, a castle, a keep, Groan, Groan and lots of other mumbo jumbo that didn’t mean much to me until about five solves later, the misprints seemed to be saying something about a bomb. Google called. Not an hour into our solving, we had the theme, THE RHYME OF THE FLYING BOMB. What’s more, we had the occasion – July 9th, the centenary of Mervyn Peake’s death. A friend who tells me he solved this one in about three hours said, ‘I wonder whether all the solvers who moan about carte-blanches have developed the instinct of going to the Internet to find out whose centenary falls on the day, or what significant event. Not a bad tip! Plain sailing from there on? Well, I got there faster than with the Sabre a while back (I calculate a mere eight hours in all compared with my twenty then – which seems to have surprised all the clever fellows who think two should suffice). Having the title of ‘A WORK BY THE SAME CREATOR’ made finding the misprints much easier and by midnight, I was convinced I had seen a pattern of clue lengths between clues 7 and 20. Yes, thank you, Phi. 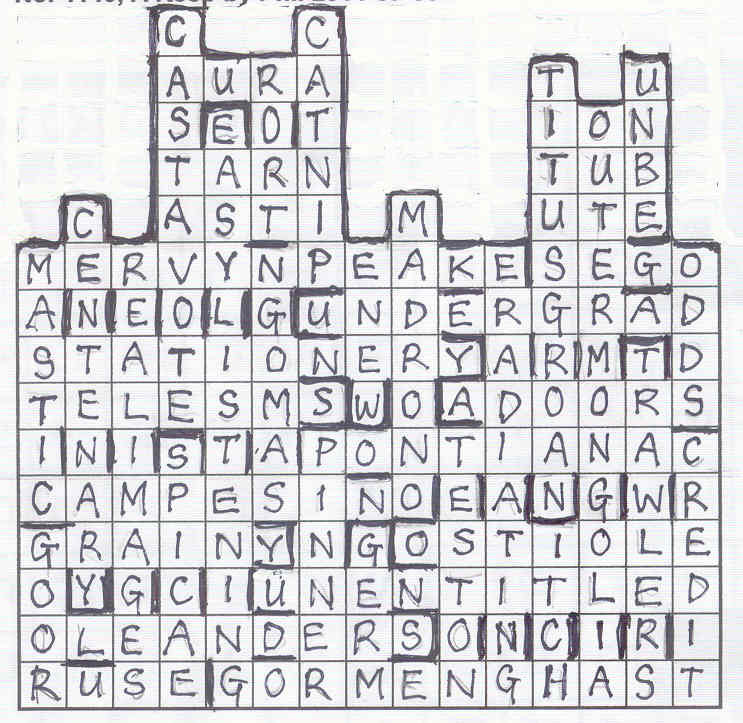 We work, these days, on the principle that a Listener crossword can never be as impossible as it looks at first sight. There will always be some clue in the preamble that will give us a key to a Gormenghast door – and, of course, there was. ‘THE SECTION OCCUPYING THE BOTTOM TWO-THIRDS OF THE GRID HAS 180 DEGREE SYMMETRY”. Saturday saw us attempting to complete the 18 clues we still hadn’t ‘cold solved’. We’d found the tipple (does Phi honestly go for ASTI down under when there are such infinitely superior kiwi wines – well he did confirm my conviction that all these compilers are in the Listener compiler oenophile society) but didn’t have much else in those clues at the top. I wonder, too, how solvers manage if they don’t have Ross Beresford’s Sympathy and TEA, or Antony Lewis’ Crossword Compiler software. 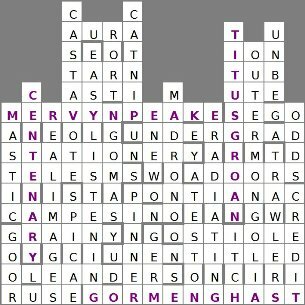 I fiddled around with the solutions I had and attempted to complete a 15 X 10 grid, beginning with Mervyn Peake and ending with Gormenghast but the lack of several solutions made this a most laborious process. PONTIANAC (obligingly supplied by Anne Bradford’s indispensable Crossword Solver’s dictionary) and CAMPESINO were going to be in the two centre lines of the grid and that was the key. MASTIC fitted between them and the remaining grid fill was magic. Of course, having ‘SGROAN’ made it clear that we were not needing TITUS ALONE or TITUS AWAKE, the one Peake didn’t live to write, and slowly the turrets rose from the crenelated battlements of our keep. Needless to say, Phi had laid a trap up there too – a meutrière? – did you notice that the clue that led to RORT (Rolf Harris cheaT/P recorDING Omitted from account) could also have led to DINGO – another Oz word for a cheat? Oh the Gormenghastian deviousness of the whole thing! Even that initial instruction about the numbers was calculated to lead simple souls astray. In fact, the numbers did more than separate the clues. They gave us the solutions in conventional numerical order, just as, in my book, they should. Only one nightmare left – putting in the bars but, that done, I couldn’t resist pictorially representing what it was like storming Gormenghast. The other numpty said , ‘You should have put a team in hard hats with a battering ram’. Yes, I know, but I can’t draw one of those. Delightful, Phi (please ignore all the moaners about blanc manges and so on – it can’t be your fault that this was the fifth this year – correction, it is partly your fault as I see that two of them were yours!) Perhaps if we upped our subscription, we might qualify for a few bars and numbers (or even for no numericals if we paid double!) Enough. Many thanks! “My aim is to put down on paper what I see and what I feel in the best and simplest way; and write when there is something that you know; and not before, and not too damned much after.” I carefully (and uncharacteristically neatly) recorded this quotation in a small notebook some 25 years ago at a time when I was reading through much of Hemingway’s work, and it seems quite apposite now. But Shirley twisted my arm ever so nicely, and wrote a wonderful blog, so it would be churlish of me not to say a few words about setting this puzzle. I have to start off by expressing a debt of gratitude to Pieman for asking me to test-solve his excellent Liberty Bell around April 2010; not only did this sow the seed, but gave me enough of a head start that I was able to complete the puzzle and submit it in time for publication on the anniversary. In the couple of months after the test-solve, I kept on seeing patterns in the bars of puzzles I was working on, and eventually I became obsessed about finding a compelling symmetric phrase that could be written in the bars. Preferably (though I didn’t hold out much hope) there should be a thematic connection to bars – musicians, the legal profession, gold bullion, atmospheric pressure, Scottish jokes, fish (‘SWIMS’ was an early possibility as part of the message), high-jumpers, pole-vaulters, and barflies were all fair game. I spent quite a while exploring the possibilities. Hemingway wasn’t immediately obvious because the symmetry didn’t cover the middle letters, but the strong thematic connection made me examine this possibility quite carefully. Spotting 1961 was a eureka moment – very exciting; even Hemingway’s age was 61 at the time of his death! And the timing of this discovery could not have been more perfect. I took these ideas down to Italy for my summer holiday and worked through various grid ideas. I wasn’t sure initially what to do about the N. I think it was clear in my mind from the beginning that drawing its diagonal was going to be the means to ensure that solvers understood the bar theme, but it took a while before coming up with the (in retrospect) fairly obvious idea that it should also be a dividing line between two entries. In the end it was this that just loosened up the constraints enough for me to construct a fillable grid into which I could also fit ‘For Whom the Bell Tolls’. Before this, the early grid prototypes had a block cut out of each corner; and at one point, the most workable grid I had insisted on putting both ERNEST and SHACKLETON in the fill, but I was quite relieved when I was able to discard this. In the end I was very pleased with the N aspect of the grid, as the various wrong alternatives were all plausible: a forward slash (i.e. a backward N) being the natural way to divide the cell, an H might stand for Hemingway, and a bar along the top of the cell might look like a small N but is ruled out because of symmetry. By the time I left Italy I had the grid, fill, and an initial full set of clues which I honed over the following months. 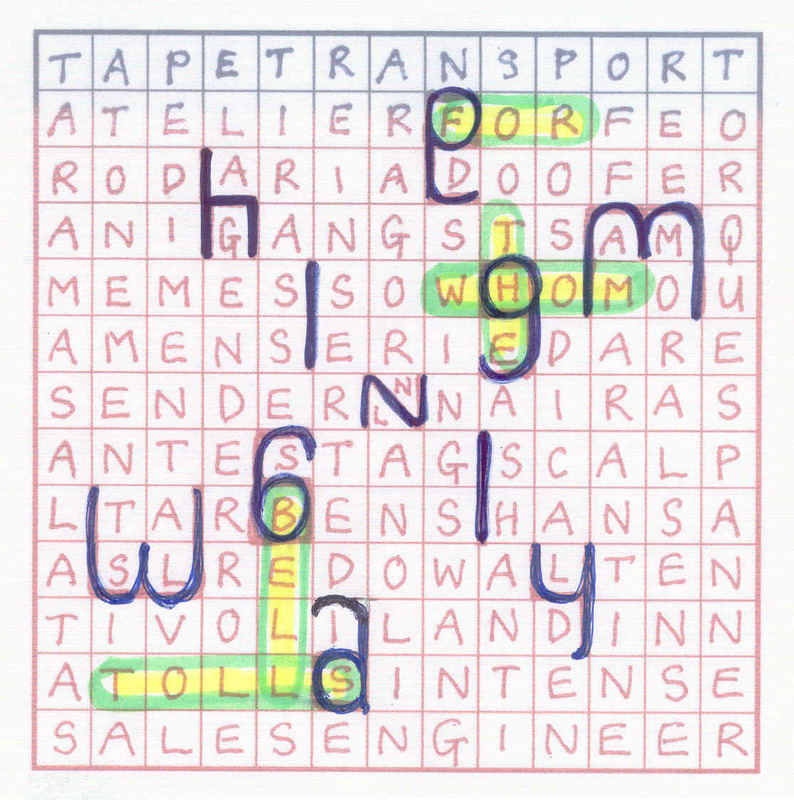 Given the necessity for both a carte blanche and a message (referencing the bars in order to make the thematic connection), I tried to make the clues a bit easier than usual. Writing the ‘misprint in the definition’ clues was as enjoyable and time consuming as always. The hardest was for SWING-SWANG – I could think of only one misprint for defining SWING-SWANG which produces an ‘I’ – namely Pernod to Period – and this needed to be at the beginning of the clue to avoid any change in capitalisation. I expect there are some other treatments, and I’d be interested to hear suggestions. Incidentally, Piers Ruff (Pilcrow) points out that there is a Swing-Swang lane in Basingstoke which, belying its name, appears to be quite straight. With the puzzle coming together so nicely, a satisfying bonus was the clue for STAG (‘In depression there’s time for whiskey – single malt?’) – quite apropos given the subject matter. Many thanks as always to all who took the time to comment on the puzzle and the clues. There’s the next reason for despair. How can hopeful compilers ever compete or to rise to anything like that standard of cluing? Well, there was at least one source of delight. This one absolutely confirmed my conviction that there’s a thriving oenophile community of Listener compilers. It was simply oozing out of the clues. ‘In depression (he says, predicting how we lesser setters and solvers might be feeling) there’s time for a whiskey – single malt?’ Well, I nipped off and enjoyed one before realizing that I was actually being offered a ‘single male’ – a STAG (so we get sTag in the place of sWag). Dare I admit it, I am actually beginning to enjoy the cartes blanches. 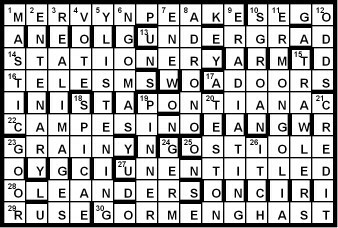 Those four thirteen-letter words around the perimeter were a gift, then the grid made sense with only four rows left to sort out before I had slotted in a single clue. 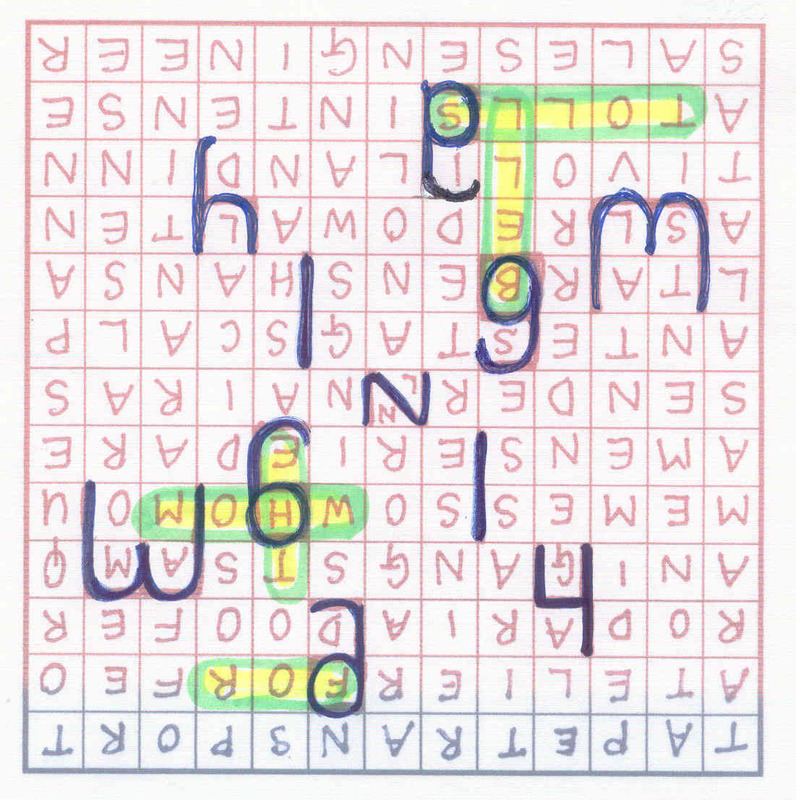 Splitting the across clues in the centre suggested that 7 and 31 down were going to share that centre letter (as they did, ARAGORN – R in Aragon, taking the upper half of the ultimate N and LANOLIN, ‘LA’ and ‘lin’ around ‘no’ fitting in below). The two letter clues were surprising, but clearly the reason would emerge for an obvious TA (‘return last couple of meat shanks – for ‘thanks’) and MO (‘Way of working ‘ – Modus operandi’ – a pit – for ‘bit’). Those two illustrate the reason for my sheer joy in the solving of this one. The surface reading was flawless and completely deceptive. What about the Lake poet? ‘Coleridge, essentially (ERI – his middle letters) English (E) lakeside poet’ – gives ERIE, a lakeside port. This magic went on and on with every clue producing a new burst of laughter. ‘Spread feed around pig’ (3) The grid was telling me that SOW was the answer but could I see the misprint? (Of course, that’s to ‘spread seed’!) This is what Listener solving should be like! I just wonder how many hours (months? years?) have gone into honing down these gems. Once Havana and La Floridita had appeared, it was clear that we really were in alcoholic company with none other than Papa Hemingway and it was a short step to the Ritz Bar in Paris and Sloppy Joe’s Bar in Key West. I like it when there is a penny drop moment half way through the solving that renders the rest of the unsolved clues easier to find. For example, ‘Agent’s seen to load of things’ looked like HOOFER, GOOFER etc. but that Y solved the clue. A DOOFER is a ‘thingy’ (for things) so we were going to load OF into DOER. Full grid and a title to hunt for. It was going to be ‘resonant’ so I didn’t waste time looking for The Snows of Kilimanjaro or even The Old Man and the Sea. Do I get my knuckles rapped for saying that I really dislike just about everything Hemingway wrote – just a load of repetitive, self-indulgent maundering. I can hear howls of protest but bet none of the defenders have waded their way through The Old Man and the Sea half a dozen times with bored tenth graders. Even Listener numericals are light relief in comparison. I couldn’t see a useful G, W or Y anywhere so where could the culprit be hiding? The Internet produced one startling fact. Today is July 2nd, the fiftieth anniversary of his death! What fine Listener timing. Clearly that number (1961) had to be hiding somewhere. Memories kicked in of Pieman’s Liberty Bell, where we had ‘LET FREEDOM’ made out of the bars in a RING or circle. Could Hemingway be hiding in the bars? Sure enough he was, (where else in this boozy crossword?) and his symmetrical year of departure. (Did you try turning the whole grid upside down? I did!) Now that’s what I call 180 degree symmetry. Shackleton has done it again. Many thanks for all that enjoyment.